Our 4 year old son , Draven, loves ice cream and on his own wanted to be an ice cream man. His main request was that he have an ice cream truck to walk with him. He picked this costume idea in September and never waivered. 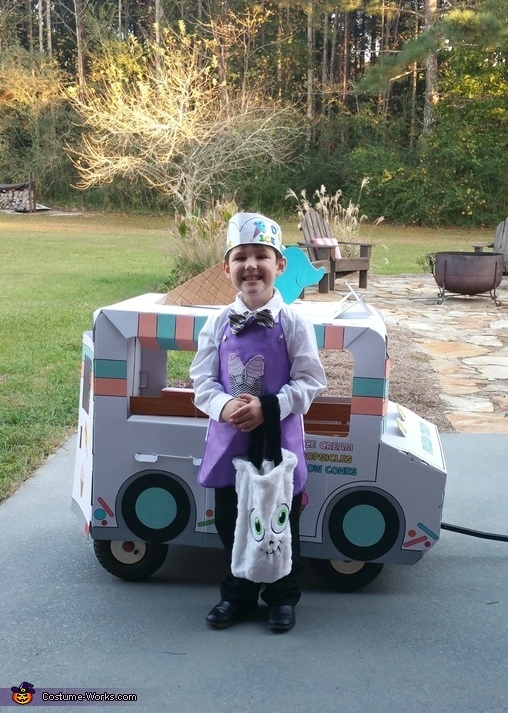 His costume is made from consignment sale clothes $3 white button up shirt $1 plain black pants , dollar tree paint apron $1 with iron on patches $3.A Krispy Kreme hat painted over and scrapbook stickers on the sides. I already had all the paint so we spent time together picking out the colors.